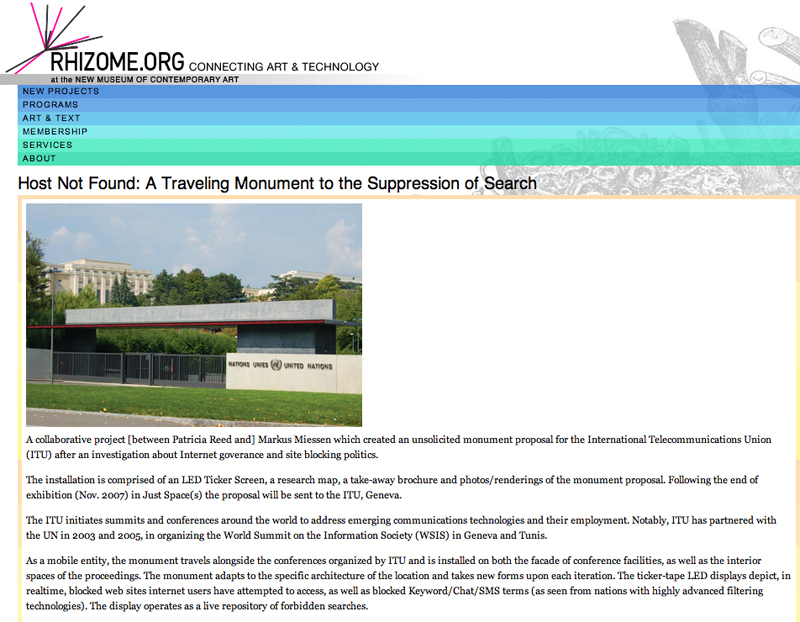 An unsolicited monument proposal for the International Telecommunications Union (ITU) after an investigation about Internet governance and site blocking politics. The installation is comprised of an LED Ticker Screen, a research map, a take-away brochure and photos/renderings of the monument proposal. 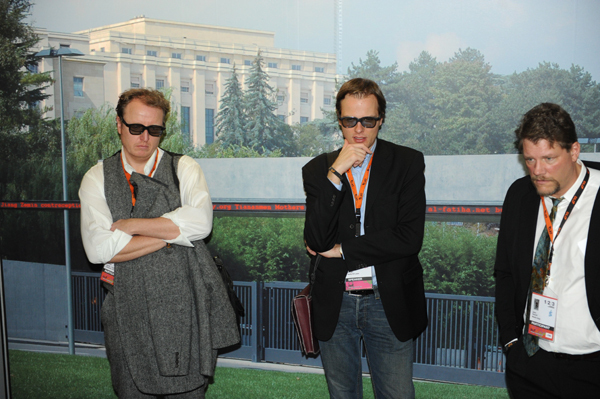 Following the end of exhibition (Nov. 2007) in Just Space(s) the proposal will be sent to the ITU, Geneva. The ITU initiates summits and conferences around the world to address emerging communications technologies and their employment. Notably, ITU has partnered with the UN in 2003 and 2005, in organizing the World Summit on the Information Society (WSIS) in Geneva and Tunis. As a mobile entity, the monument travels alongside the conferences organized by ITU and is installed on both the facade of conference facilities, as well as the interior spaces of the proceedings. The monument adapts to the specific architecture of the location and takes new forms upon each iteration. The ticker-tape LED displays depict, in real-time, blocked web sites Internet users have attempted to access, as well as blocked Keyword/Chat/SMS terms (as seen from nations with highly advanced filtering technologies). The display operates as a live repository of forbidden searches. Adopting the real-time Keyword displays as is infamously found in several Google offices, we propose to also display the queries that are never or only selectively returned. The title of the monument borrows from terminology used by some national firewalls, who mask their filtering practices by serving up web pages reading ‘Host not Found’ or ‘Connection Timeout.’ Likewise, the monument references the history of ‘moral monitoring’ by referring to Anthony Comstock’s (of the Comstock Act) founding of the New York Society for the Suppression of Vice (NYSSV), in 1873.